I’m back with Part 2 of my 4-part series on how to live an extraordinary life as a woman. Last week, we cracked open the topic of emotions. Today, I want to go farther. Because awareness and insight will only get you so far. Feelings and emotions are not – and cannot be – a head trip. They are a body trip. Feel is from the Old English word, felan – to perceive through the senses. So, let’s break this out a little. Feeling is how we establish a relationship with ourselves. Something happens, and it either feels good, or it doesn’t. The way a human being is structured is that when we are safe/happy/healthy, we locate our center by moving in the direction of pleasure, or what feels good. When we truly feel, we can sense when it’s time to move away from what is unsafe or bad or wrong. If we don’t take the time to locate ourselves, then we are lost. What to do to begin to feel again? It starts with the body. You cannot experience your emotions with just your head. We jump for joy for a reason. Joy cannot be contained or expressed by thinking. You gotta jump or it just ain’t joy. And have you noticed, when you jump for joy, that it is not permanent? You kinda jump for a few, leap around for a bit, and then go on about the business of your day? You are not attached to it. And the dark emotions are the same. Each of them has a life cycle, a timeline, a beginning, a middle, and an end. We just don’t ever have the opportunity to give in, surrender, explore, and experience darkness. We only green-light light. And what shape is despair? Bent? Straight? Immobile? How does bottomless grief look? When I was first studying the bodies of work that eventually evolved into the School, I studied the indigenous cultures, and the ancient goddess religions. I learned that when the feminine divine was in the house, every facet of the human experience was celebrated with equal gratitude. Death and birth were gifts of the Divine. The sun, the moon and the stars all contained Divinity. And I extrapolated from there, that if darkness and light were perfect, then the darkness and light within myself was perfect. And I started a practice of embodying my feelings. I learned how to move an emotion through my body, how to bypass my head, and drop to my knees before the feeling I was having. I stopped pretending I wasn’t having an emotional response, when I was. And I learned something: when I surrendered to my feelings, I was filled with feminine power. I felt me. Beautiful, changeable, grounded, emotional me. Your assignment this week is to start experimenting with embodying your emotions – especially the darker ones. The idea is to get out of your head, and into your body. Fortunately, we have music to transport us to a place of connection. You know how a piece of music — a lyric, a phrase, a note — can unexpectedly plug you right into a deep powerful emotion? Well, that is the perfect place to start feeling more. ​Try out this carefully curated playlist to yank your emotional chain and allow you to connect with the molten gold that lives inside of each of us. Play the list loud. Make sure to leave a comment below – I’d love to hear what comes up as you dance, move, roll around, throw pillows, stomp, moan and connect with the feelings these songs help bring forth. In case you missed it, you can check out Part 1 of this series right here. Then, continue on to Part 3 – the big kahuna pure gold ingredient that makes living extraordinary. Go full circle with Part 4 – the truth about mean girls. 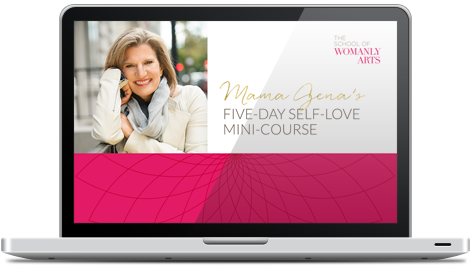 And one more nudge – if you feel intrigued, curious, or flat out ravenous to learn more about how to access your power and joy as a woman – get your extraordinary self to The Experience, on December 2nd & 3rd in NYC. It’s a live intro weekend – and it’s my gift to this community. See you there, okay? Learn more right here. I dare you to answer this question honestly. Get right with your darkness. Ever been told you’re “too much”?